Boiling juice first and adding fruit at the end to preserve color,taste and texture of raspberries. Raspberries ripen fast in a heat wave,at a rate of 2 quarts a day from my 40′row. With no chest freezer at our house,making jam has proven to be the best “value added”approach to preserving the precious fruit (last seen at $5.50/pint at a local store). We stuff as many berries as we can in Ziploc bags in the refrigeratorfreezer (after freezing them on a cookie sheet in one layer to keep them whole),and invite friends and neighborhs over to pick,but still end up making jam at least two times a week. It’s not my favorite task on a hot day but once in the swing of it,I can process a batch in 30 minutes. A good vent over the stove keeps the kitchen comfortable and I still love the scent of raspberry essence and the jewel red,viscous juice bubbling away. For 8 cups of raspberries I use 4 cups of sugar and one lemon cut in half,seeds removed. Mixed together in a bowl and covered with a clear plastic or other cover, I set it in the sun to macerate for an hour or more,stirring occasionally. 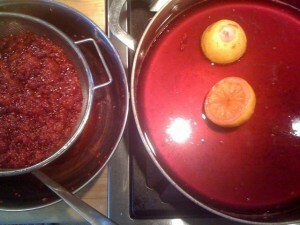 The goal is to separate the juice and pectin from the fruit and melt the sugar. This can be done by storing it for several hours in the fridge too,but I like working with a sun-warmed product better than starting the jam chilled. Saves energy too. When the sugar is mostly dissolved, pour just the juice and lemon halves into a wide pan and boil at a fairly high heat,leaving the fruit to drain in a colander set over a bowl. Periodically add the juice collected in the bowl into the boiling jam. When the juice has reached 230 degrees F (thread stage),fold in the fruit and cook it until berries are just cooked and jam is thickened to your liking (usually no more than 5 minutes). Meanwhile, there’s a large pot of water boiling with clean canning jars,sterilizing. I toss the lids in at the end,lift the jars out and fill them with jam, pop the tops on,tighten the rings,then back into the pot to boil for about 10 minutes. Lift them out and let them cool before labeling and storing. Clean up is super easy when all the sticky pots,spoons and bowls are dumped into the sink and the hot canning water is poured over,the mess just melts away. Sounds yummy. I love the way you describe your process. It’s like a lab protocol or as a maths oriented friend of mine said an algorithm.